I hope you will have a crafty weekend - or at least a little time to make a card or a scrapbook page. This card was made with some scraps on my table. Instead of making lots of layers (like I usually do), I decided to just distress the edges of all my papers which gives my card a dimensional look without bulk. 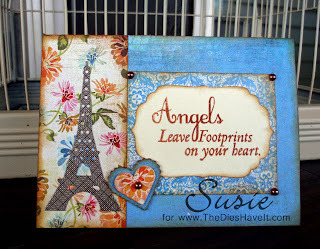 My sentiment and the hearts are all cut using Spellbinder's dies. The cute Eiffel Tower is cut using a MFT Stamps die. I also want to share with you that my sentiment is from one of the four January stamp sets released by Inspired by Stamping. The set is called Touched by an Angel. You MUST go and take a look at all the sets. And then....hold onto your hats....next week there will be EIGHT stamp sets released as well as some lovely flowers. More on that later in the week. Stay tuned. Tomorrow I'll be back with a Cupcake Inspirations project to show you. Hope to see you then.